Elemental Excelerator, based in Honolulu, Hawaii, has just announced its 2018 cohort of companies. The 12 companies focus on three major trends: applying machine learning to energy and mobility, commercial application of peer-to-peer energy sharing, and finding ways to reach underserved communities. As with its previous cohorts, the Excelerator focuses on companies that offer energy, water, agriculture, mobility, and cybersecurity solutions across Hawaii and the Asia Pacific region. Using Hawaii as a testbed for energy and climate solutions has long been a focus, and Elemental Excelerator has been a key part of the state’s growing renewable economy. Hawaii is becoming quite the energy hub, with cleantech accelerators like the Elemental Excelerator, and tech accelerators such as Blue Startups and XLR8UH, along with a state and city government that has taken a strong stance in the fight against climate change. While its work is focused on solutions for Hawaii and the Asia Pacific, the 2018 cohort is one of the most geographically diverse to date, with 42% of the companies headquartered internationally. This reflects not only its interest in finding the best companies for the cohort from around the world, but mirrors the geographic diversity of its Global Advisory Board, which includes public and private partners from Japan, Hawaii, South Korea, Europe, New Zealand, Philippines, and the US mainland. The competition this year was the largest ever: 450 companies applied, and only 200 met the minimum requirements, and a final total of just 12 companies were chosen, giving it a 2.7% acceptance rate. Which companies made it to the Elemental Excelerator’s 2018 cohort? There are four sectors within which the cohort companies can be classified: water, mobility, grid, solar, and food/agriculture. This reflects a broad approach to energy that is critical to success. Elemental Excelerator takes into account a holistic understanding of collective energy needs and how functional solutions need to take a wider approach to solutions. Companies below are divided into two types: Demonstration and Go-to-market. Demonstration companies are ready to scale. They have an innovative technology, excellent team, customer traction, and the resources to grow, and the Excelerator helps the company scale in Hawaii and Asia Pacific markets. Go-to-market companies have an innovative technology and a working prototype, and excellent team of 2 or more people, and need to vet their product/market fit and find customers. Why do we love them? Within five years, water bills will be unaffordable in 40% of US households, underscoring the need for families to be able to understand where they’re using water and how to control it. Buoy’s smart device attaches to a home’s water line and sends water usage data to a mobile app. The app analyzes the information and presents it in a visual dashboard identifying water use by appliance (e.g., washing machine, shower, hot water heater), giving homeowners an easy-to-understand, real-time picture of their water use. Why do we love them? Honolulu is one of the most traffic-congested cities in the US. Blyncsy is taking a systems approach to help solve traffic problems. Rather than focusing on optimizing individual vehicles, it is focusing on optimizing the transportation grid as a whole. Blyncsy installs sensors on street poles and other infrastructure that anonymously collect movement patterns. Its software analyzes that data to provide actionable insights and optimize the flow of traffic. Why do we love them? Swiftly enables the use of real-time data to help transit agencies make critical infrastructure decisions to efficiently move people. Swiftly is the creator of Transitime, the most advanced passenger information system on the market. Transitime monitors the real-time and historical movements of buses and other public transportation vehicles to predict arrival and departure times more accurately than existing systems. Swiftly has deployed in more than 30 cities worldwide. Why do we love them? Research suggests that improving the decisions of airline captains can cut an airline’s fuel use up to 20%. Signol’s software analyzes pilots’ fuel consumption and delivers information that incentivizes pilots to reach fuel-efficiency targets. Signol completed a first-ever field experiment and case study with Virgin Atlantic Airways. This project cut 55 million pounds of carbon emissions while saving the airline $5 million in eight months. Pilots continued to demonstrate fuel-efficient behavior for at least six months after the field experiment ended — and the pilots reported higher job satisfaction. Why do we love them? eMotorWerks’ EV chargers are the number one selling chargers on Amazon.com. But…that’s not its core product. 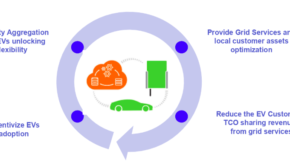 Meet JuiceNet, an Internet-of-Things platform for managing vehicle-to-grid EV charging. JuiceNet not only manages charging in eMotorWerks chargers, but also in chargers manufactured by other hardware partners and increasingly in EVs themselves. eMotorWerks is on track to control more than 2 gigawatts of virtual power plant capacity by 2020 — a result of aggregating the charging load of more than 250,000 electric vehicles. And it was a big month for eMotorWerks: it was acquired by EnerNOC (the US subsidiary of Enel) just a week after the new cohort announcement. Read more here. Why do we love them? Opus One Solutions has developed a calculation engine for transactive energy, a tool to inform a new era of business model innovations at the grid edge. Transactive energy is model-driven pricing that calculates the value of a kilowatt hour at different locations across the grid, to provide accurate market signals for the value of storage, generation or grid services at any given point in time. Opus One is currently working with more than 12 utilities in North America, deploying its solution across more than 4,500 medium voltage distribution feeders. Why do we love them? In statistics, the strongest correlation does not imply causation. 99% of analytics solutions on the market today rely solely on black box approaches to make predictions. Via Science has developed a software engine that provides explanations about why a prediction or recommendation is made. This helps utilities improve maintenance plans and provide transparency to regulators regarding their grid modernization recommendations. Why do we love them? Nnergix’s technology predicts the future behavior of infrastructure (including solar and wind generation) using advanced weather data, machine learning, and analytics. The market for weather forecasting systems is predicted to be worth nearly $2 billion by 2020. Why do we love them? Electric water heaters represent 40% of installed heaters worldwide and are the largest residential energy load. Shifted Energy uses a combined software and hardware solution to aggregate and control electric water heaters. The aggregated water heaters act as a virtual power plant, which the utility can cycle on or off based on real-time grid needs. Shifted has proven low-cost load-shifting at scale through a 499-unit rental property (an Elemental Excelerator project). Why do we love them? Solar Analytics’ mission is to use software and data to empower people. Its cloud-based data and analytics platform uses real-time energy and weather data to 1) analyze how well a solar installation is performing, and 2) provide actionable insights to maximize returns for homeowners. Solar Analytics is the largest solar monitoring provider in Australia. Its product is being used at 15,000+ sites with more than 10,000 customers. That’s a lot of data! Why do we love them? Allume has built a tool that facilitates behind-the-meter sharing of electricity generated from rooftop PV panels to supply multiple, separately metered dwellings, such as apartment buildings. Its solution enables apartment renters to go solar by removing the barriers to entry for multi-dwelling residents, and allowing the apartment building to maximize the use of daytime solar. Customers pay for power rather than paying for panels. Why do we love them? Managed grazing can build soil health, increase grass growth up to 4 times, and save ranchers on annual feed costs. Those results require actionable data and the digitization of a largely paper industry. PastureMap is connecting data through the beef supply chain to achieve a triple bottom line: 1) traceable, healthy beef that’s better for consumers, 2) profitable rancher and farmer livelihoods, and 3) building soil carbon and healthy grasslands.